What can you tell me about the prescription drug scopolamine? Is it the same thing as the South American "zombie drug"? Wasn't it used as a truth serum? Why would a doctor ever prescribe it? A botched Soviet plot to kidnap a West German radio interviewer supposedly hinged on candy laced with scopolamine. When ancient South American chieftains died, it's said, their wives and concubines were dosed with the drug and led into tombs to be buried alive alongside the deceased. Present-day tabloids insist that Chinese gangs in Paris are using it to dope prosperous victims, who then helplessly empty their jewelry drawers on command. 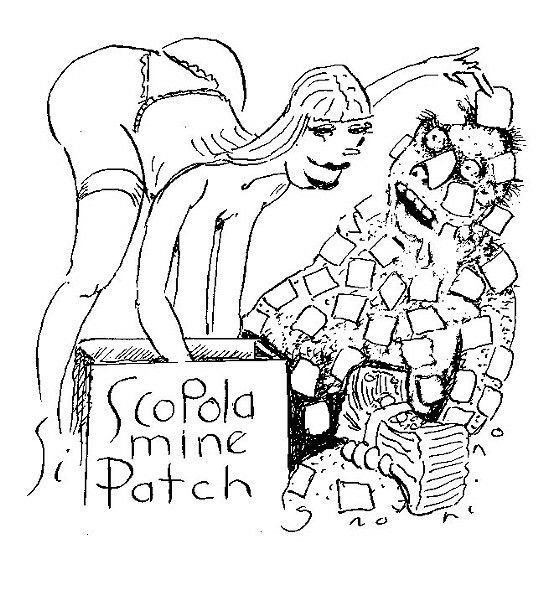 Such exotic tales have lent scopolamine a menacing aura and the grabby sobriquet of "the most dangerous drug in the world." But the milligram and a half in that transdermal patch your general practitioner gave you for motion sickness poses no threat of transforming you into a mindless zombie anytime soon. Scopolamine is the active ingredient in burundanga, which is a powder made from the seeds of a picturesque tree known locally in Colombia as the borrachero. Because of its hallucinogenic properties, burundanga figured in the spiritual practices of some indigenous peoples, and they used it medicinally as well. Synthetic scopolamine wasn't manufactured till the early 20th century, when it became popular as a childbirth sedative that not only relaxed moms but dimmed their memories of pain after the fact. And, yes, by the 1920s scopolamine had become the first drug billed as a truth serum. The twilight haze it induced left patients able to converse but seemingly less inhibited; the Texas doctor who pioneered its use in interviewing criminal suspects claimed it impaired reasoning enough to make lying impossible. Interrogators soon decided, however, that the side effects made scopolamine more trouble than it was worth. The biggest problem? "The fantastically, almost painfully, dry 'desert' mouth brought on by the drug is hardly conducive to free talking, even in a tractable subject," a CIA analyst reported in 1961. Even moderate doses sound like a bad time, unless you enjoy protracted pupil dilation. Trippy as its effects can be, there's a reason no one's ever offered you this stuff at a party. But you can get a scrip for it, though it's not like pharmacies are handing out bottles of pure scopolamine tablets. The clinical name is hyoscine, and its most common usage is in a patch worn behind the ear to ease nausea, whether postoperative or just your basic carsickness-type. Scopolamine reduces certain organic secretions (hence the dry mouth) and also dampens nerve signals that trigger vomiting. Under the name Buscopan (widely prescribed everywhere but the U.S.), it's used to treat abdominal pain. Scopolamine can also provide relief from symptoms of Parkinson's disease; some researchers believe it can be used as an antidepressant or to combat Alzheimer's. That's not to deny the nefarious uses it's put to. A dose slipped into a beer or plate of food can disable an unsuspecting mark enough for someone to lift their wallet, and in Colombia this apparently does happen. The claim from a 1995 Wall Street Journal dispatch that burundanga was involved in half of all poisoning cases in Bogotá's ERs seems a tad high, but the State Department's Overseas Security Advisory Council has for years been warning American visitors to Colombia to keep an eye on their drinks, citing "unofficial estimates" of 50,000 scopolamine "incidents" a year. That amnesiac quality obstetricians once prized is probably the source for the "zombie drug" myth. "You wait for a minute for it to kick in and then you know you own that person," a Colombian drug dealer once told a Vice reporter. "You can guide them wherever you want." But, although scopolamine in your drink might leave you dopey or knock you out, it won't rob you of free will. Sure, it's powerful, but not supernaturally. And frankly, the horror stories about its use in Europe and the U.S. sound fishy: Supposedly, someone just hands you a business card that's been soaked in the drug, or blows a handful of the powder into your face—but that sort of limited contact almost certainly wouldn't be enough to incapacitate you. And there were no lab results behind those alleged Paris drugging incidents to show scopolamine was the culprit; in fact, the European Monitoring Centre for Drugs and Drug Addiction hasn't reported its use at all. In a story in the Spanish newspaper El País last summer, doctors in Madrid and Barcelona insist they're seeing scopolamine victims regularly; they concede, though, that since it doesn't linger long in the bloodstream, diagnosis depends more on interpreting patients' stories than on hard chemical evidence. It's also unclear where crooks in Europe or the U.S. would be getting all this scopolamine. With no recreational demand for burundanga, are serious quantities really being smuggled out of Colombia? And amassing enough of the synthetic kind would take more than a few prescriptions—you'd need an inside source at the lab. There are plenty of other nasty drugs out there, after all, and plenty of nasty people passing them around.